Phone too slow? Just get a faster processor. We've heard about the Motorola Ara project, which is developing a modular smartphone allowing you to change parts such as camera and processor with ease, but ZTE is also looking into part-swapping handsets. Motorola said back in December 2013 that its modular prototype was "pretty close", but it's been beaten to the punch by the ZTE Eco-Mobius. 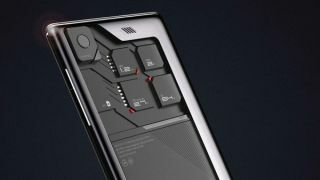 The Chinese firm showed off its own modular smartphone concept at CES 2014 in Las Vegas, and although the phone itself was behind glass it shows a step forward in the technology. The Eco-Mobius prototype allows a user to change its display, camera, battery, processor and RAM modules. This would mean you could purchase the base spec at a low cost and once you've got more cash to burn, upgrade various parts - into photography? Then buy a better camera module. Running out of juice? Get yourself a bigger battery. As to when we may actually see a modular smartphone actually hit stores, the people over at ZTE reckon the technology is two years away - CES 2016 better watch out.